Today We Honor Our Veterans, but What About Tomorrow? The study surveyed nearly 1,200 pre- and post-9/11 veterans from all military sectors residing in Los Angeles County. Of the post-9/11 veterans, 41 percent were age 30 or younger, 34 percent had at least a four-year college degree, the vast majority received an honorable discharge from service, and almost three-quarters were people of color. More than one in five post-9/11 veterans had an annual income below or nearly below the federal poverty line. Forty percent of post-9/11 veterans reported being homeless in the past year. This includes veterans who slept in a transitional residence — like a shelter, friend or family member’s home, motel, jail, or hospital — as well as in a public place. Twenty-four percent of post-9/11 veterans reported suffering from severe physical health symptoms, and just under a quarter had been screened positive for a mild traumatic brain injury. Forty-six percent of post-9/11 veterans screened positive for post-traumatic stress disorder, 46 percent screened positive for depression, and 15 percent had considered attempting suicide. …veteran support agencies are typically organized to support only one or two of these issues. For instance, it is typical to see ‘campaigns’ targeting veteran employment or housing, while ignoring health and education (including skills training and deployment), assuming, often incorrectly, that other agencies are meeting the veterans’ needs in these areas. […] Service providers must recognize that a holistic approach to veteran support is needed, and that they most likely only represent one or two parts of that approach, and maybe not even the most important part, depending on the needs of the veteran. Unaddressed homelessness, physical and mental health issues, and chronic unemployment put veterans at risk of contact with the criminal justice system. Although reliable data are scarce, a 2013 study found that in 18 randomly selected states, between 2 and 20 percent of the prison population reported having veteran status. The study reviewed more recent localized data and concluded that the proportion of incarcerated individuals who are veterans is rising. The analysis also raised the concern that veteran courts — specialized alternative court systems for veterans — may not be responsive to the complexity of the problem. The study stressed the importance of understanding the often lasting effects of military service that shape veterans’ behavior and yet are often overlooked by the courts and treatment teams. These studies emphasize the importance of recognizing the unique needs of our veterans and the absence of comprehensive public services and supports to address them. Service agencies must make a commitment to working collaboratively to support individuals returning from the military. 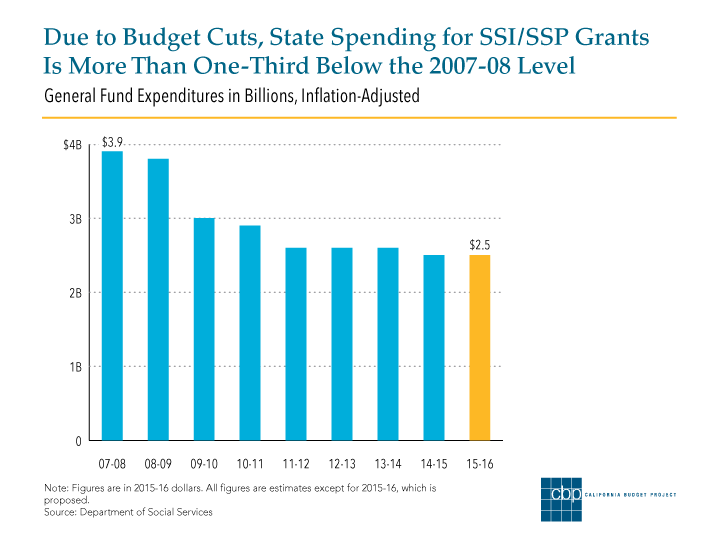 The SSP cuts in 2009 came as the Great Recession gripped California and state lawmakers looked for ways to reduce spending in the face of a two-year, $60 billion budget shortfall. 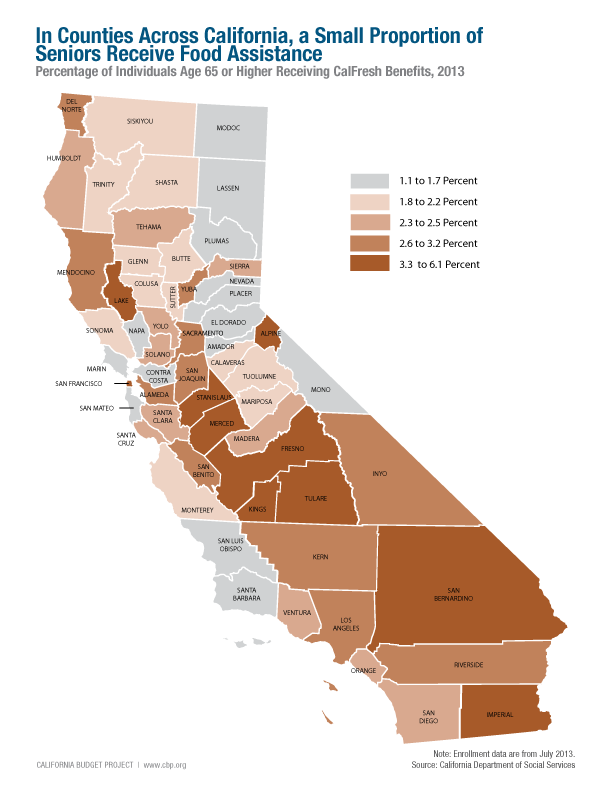 Today, although the state’s economy and finances have been slowly recovering from the downturn, low-income Californians who rely on SSI/SSP cash assistance have been left behind. While the SSI portion of the grant has modestly increased in recent years due to federal cost-of-living adjustments (COLAs), the state’s SSP portion remains frozen at recession-era levels: $396 for couples and $156 for individuals, the minimum levels allowed by federal law. Why haven’t SSP grants gone up? Because — in addition to reducing SSP grants in 2009 — state policymakers eliminated the annual state COLA. As a result, the state’s portion has not been increased to reflect changes in California’s cost of living over the past several years. Without a doubt, these budget cuts substantially lowered the state’s costs for SSI/SSP. In 2007-08, the year the Great Recession struck, the state spent about $3.8 billion on its share of SSI/SSP cash assistance (in 2014-15 dollars). Fast forward seven years: California will spend a projected $2.5 billion on SSI/SSP grants in the current fiscal year — more than one-third below the 2007-08 level. This substantial drop in state spending has occurred even as the number of Californians enrolled in SSI/SSP has increased, rising by 6 percent — to 1.3 million — since 2007-08. But these state “savings” have come at a tremendous cost to low-income seniors and people with disabilities. SSI/SSP cash assistance once uniformly lifted recipients out of poverty, but no more: Today’s maximum grant for individuals equals just 90 percent of the federal poverty line, jeopardizing the ability of seniors and people with disabilities who rely on these grants to afford basic necessities such as food and housing. 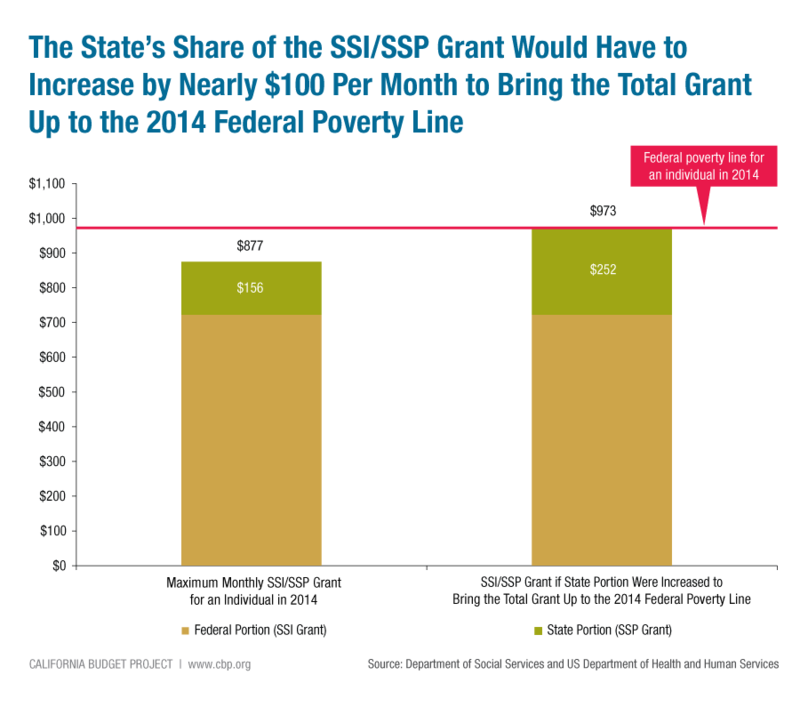 The value of SSI/SSP grants has fallen so sharply in recent years that the state’s SSP portion would have to increase by nearly $100 per month in order to bring the total grant for individuals up to the 2014 poverty line. Five years ago, in the midst of a severe budget crisis, the state made a series of deep cuts to SSI/SSP grants. The question now — for state policymakers as well as the general public — is whether these reductions, which target some of California’s most vulnerable residents, should be temporary or permanent. The Senate Select Committee on Women and Inequality convened last week in Los Angeles to explore strategies for promoting economic opportunity for women in California. Throughout this hearing, the importance of child care was a recurring theme. As Senator Holly Mitchell discussed, the state’s 2014-15 spending plan includes some reinvestment in the state’s child care and development system, including an increase in child care provider payment rates. Provider payment rates are a key issue in helping women and their families to advance. Adequately reimbursing child care providers increases families’ access to providers. When women have access to affordable child care, they are more likely to find and keep jobs and to have money to pay for other necessities such as rent and groceries. This is critical for their own economic success and for the well-being of their children, too. Policymakers had not raised provider payment rates since 2006, and the recently approved increase is long overdue. However, policymakers have more work to do, especially for families who use vouchers to pay for child care (as opposed to going to child care providers that contract directly with the state). Even with the rate increase included in the budget agreement, scheduled to go into effect on January 1, 2015, voucher-based providers offering care in licensed family child care homes (LFCH) will not see an increase in their payment rates for infant care in more than half of California counties. Similarly, these providers will not see an increase in rates for preschool-age children in 19 counties. In fact, across the state so few counties will see an increase that the median percent increase for LFCHs for infant care is 0 percent. For preschool-age children the median percent increase is just 1.2 percent. As we discussed in a recent blog post, California has far to go in restoring funding to the child care and development system in the aftermath of the Great Recession. Access to subsidized child care and preschool programs is a key component in helping families achieve economic security, and it is critical that policymakers continue to take steps to reinvest in California’s child care and development system. This past weekend Governor Brown announced that he had signed Senate Bill 1010 into law, eliminating the disparity between sentences for possession of crack cocaine and powder cocaine for sale in California. SB 1010 continues a positive national and statewide trend of divesting from drug war policies that are ineffective in promoting — and can be harmful to — public safety. Crack cocaine is a product derived from processing powder cocaine with an alkali, such as baking soda, to make it smokable. A study in the Journal of the American Medical Association found that crack cocaine and powder cocaine are essentially the same drug and can cause the same effects when used. Despite the similarities between these two products, sentencing laws differ in how the substances are penalized in the criminal justice system. Nationally, individuals selling small amounts of crack cocaine on the streets have received more severe sentences than have wholesale suppliers of powder cocaine. In California, possession for sale of powder cocaine has been subject to a felony jail term of two, three, or four years, whereas possession for sale of crack cocaine has been subject to a felony jail term of four, five, or six years. These unbalanced penalties have more significantly affected communities of color, even though the likelihood of someone using crack cocaine does not differ based on their race given similar social and environmental conditions. From 2005-06 through 2009-10, African Americans in California were imprisoned for possessing crack cocaine for sale at a rate that was 43 times that of white people and four times that of Latinos. SB 1010, authored by Senator Holly Mitchell, reduces the penalty for possessing crack cocaine for sale to a felony jail term of two, three, or four years, thereby bringing it in line with that for powder cocaine. Additionally, the bill aligns property forfeiture laws and probation eligibility requirements associated with crack cocaine with those for powder cocaine. This is a welcome reform that equalizes penalties for drug law violations and will help to reduce the racial disparities in our criminal justice system. This bill is also expected to have a positive impact on California’s finances. The Senate Appropriations Committee projected potential state savings from SB 1010 in the low millions of dollars each year. These savings would result from reduced prison sentences and fewer prison commitments. Given the prevalence of problematic drug use in California, these savings might best be invested in effective community-based drug treatment, education, and prevention services that could improve public safety in the longer term. SB 1010 represents a much–needed reform to a larger body of drug laws that have failed to effectively curtail supply or consumption of controlled substances; impeded public health measures designed to reduce the spread of infectious diseases, overdose fatalities, and other harmful consequences of problematic drug use; and resulted in arbitrarily harsher consequences for low-income communities. You are currently browsing the archives for the Human Services & Child Care category.